Catch Questions 5th Series! 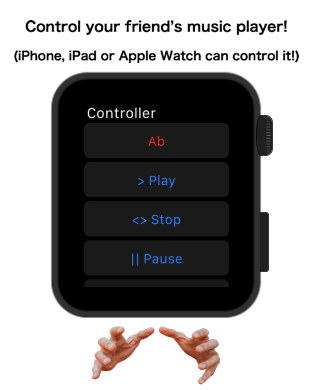 Let me show you Apple Watch App, titled Remote Music Controller. 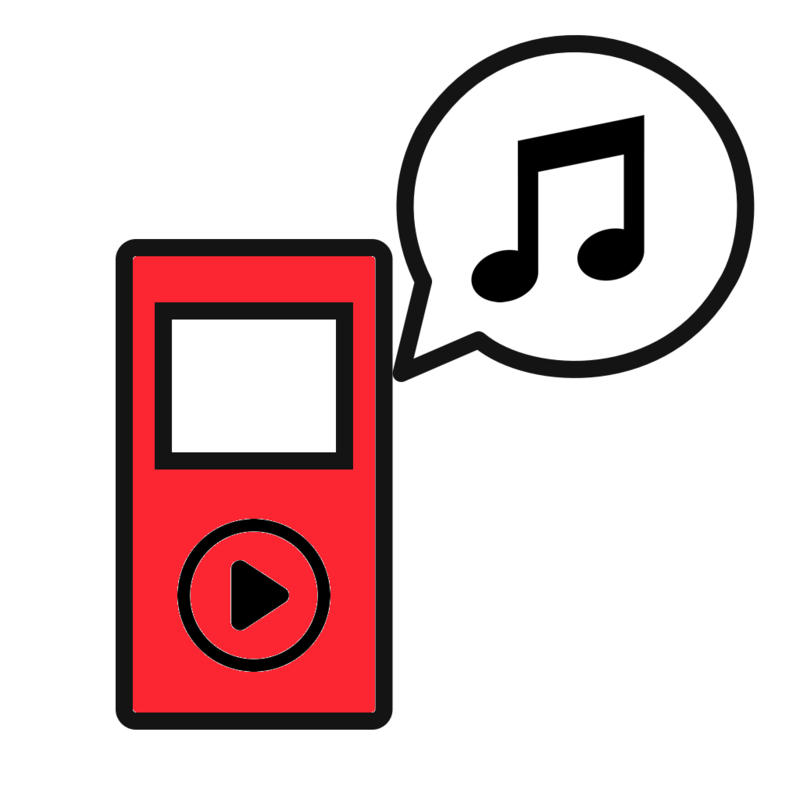 In this app, you can remotely control your music library without Bluetooth. The control system is based on internet so it is very convenient in various situations. Not only your own device but also your friend’s device such as iPhone can be remotely controlled. Please use this for Dance, Karaoke or Music Band practice like group exercise with music. 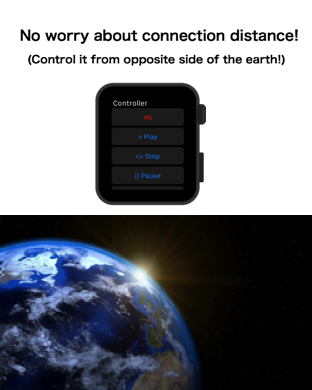 Only two Apple devices in your group can make the controller and the player instantly. Here, you can see Apple Watch and iPad. If you have Apple Watch, it is common sense Apple Watch can not pair with iPad with Bluetooth. But, now I will show you this Apple Watch can control this iPad. In other word, Apple Watch can make kind of paring with iPad with this app. In this Apple Watch, the app titled, Remote Music Controller is installed while in this iPad, the app titled, Remote Music Player is installed. They are first screens right after starting apps. 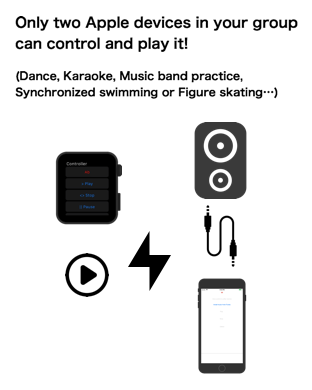 Remote Music Controller can be installed not only into Apple Watch or iPhone but also into iPad. After you start the app, you need to set ID. English or number are acceptable to set ID. You can easily make your ID from the button of “Auto ID”. If you select this, current date will be your ID. Next, you need to create Key word to share with your friends. English or number are acceptable to set Key word, too. From the auto button, you can also easily make key word but I would recommend you to make simple one so that it can be easily remembered. If you are not English speaker, please change the language to English from force touch so that you can input English. Let me input the word of “Kwd” for my key word. After you set ID and Key word, it is time to tell your friend the key word and start the other app, titled Remote Music Player in the other device. Let me input the word of “Kwd” here. The setting is now finished and try to install some music into this App from iTunes button. You need to have some music in iTunes beforehand. If you have some music, several music will be shown here. Tap your favorite music and the titles of music will be shown below. Please be careful. If you tap too many music, it will take long time to install. Can you play the music here? If it plays without any problem, press the button of “Give control”. The screen will be in black but it is fine. Why I designed this is to reduce the power consumption as much as possible. Now, on the other app, try to control the music player. You can confirm Play button or Stop button can work. From these buttons, Skip button is very convenient. You can skip to your favorite music with the number. 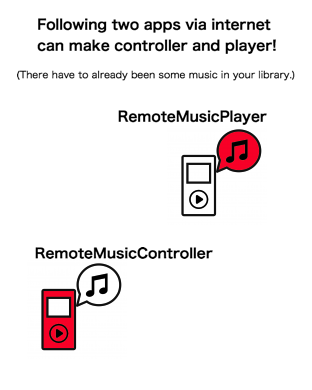 The controller can only control the music which was installed into Remote Music Player. It cannot access the other information that music. 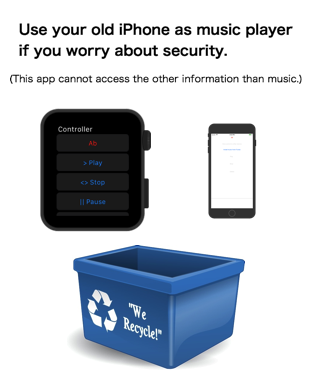 But, if you still worry about the security, please use your old iPhone or iPad as the music player. With this internet control system, your can control your music from opposite side of the earth.